SANTA CLARA, Calif. 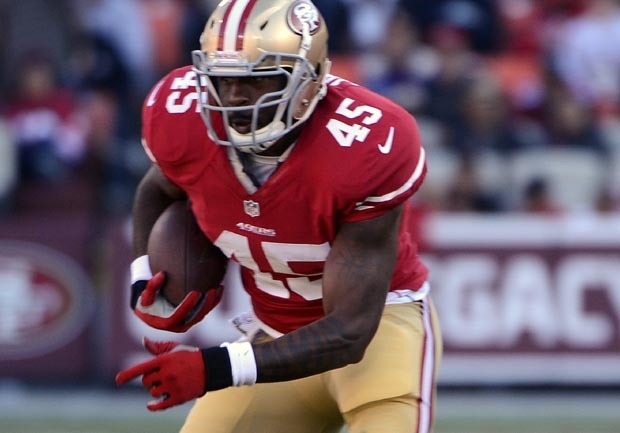 The San Francisco 49ers suspended running back Brandon Jacobs on Monday for the final three games following a series of posts on social media sites addressing his lack of playing time, including one during the weekend saying he was "on this team rotting away." The 49ers made the announcement about two hours after coach Jim Harbaugh's news conference, but provided no explanation for why Jacobs had been disciplined. It is doubtful he would return for the playoffs. On Monday night, Jacobs posted on Twitter: "Thank you all for all your support, I am doing wonderful it's not a big deal things happen, I am strong enough to get through this, again thank all of you for your support. (hash tag)IWILLBEBACK." Harbaugh on Monday declined to address Jacobs' earlier comments, even when asked whether Jacobs was still on the team. He said he was invoking his "Fifth amendment" right. The 30-year-old Jacobs has five carries for 7 yards while playing in only two games with the NFC West-leading Niners (9-3-1). He spent his first seven NFL seasons with the New York Giants and has called this his "worst" year  though he knew he was joining a crowded backfield that features three-time Pro Bowler Frank Gore as one of the faces of the franchise. CBSSports.com's Josh Katzowitz notes that when Jacobs signed a one-year, $1.575 million contract in March, he might have expected to have the chance to carry the ball when Frank Gore needed a break. But instead, Kendall Hunter has remained in the backup role. And the introduction of quarterback Colin Kaepernick to the starting lineup also has allowed San Francisco to try for more rushing yards from its signal-caller. In recent days, he posted a series of photos of himself playing for the Giants  and even a picture of his two Super Bowl championship rings, side by side. "I am on this team rotting away so why would I wanna put any pics up of anything that say niners," Jacobs said in an Instagram post Saturday. "This is by far the worst year I ever had, I'll tell you like I told plenty others." On Twitter later, Jacobs said: "I don't understand why people are angry at me because I wanna do what I am paid to do, I am a competitive person, I think people should be mad if I didn't wanna play. ... As for all of my Instagram photos I don't have any niner pics, if you'll find me some pics I'll put them up." Jacobs, hampered by a left knee injury earlier this season, spends approximately 20 minutes before games punching the goal-post padding. He has said it is his way of dealing with the situation. Last month, Jacobs posted advice on Twitter with a reference to never working "in a place where you hate your boss so much, you should always be happy at work" with a hash tag of "YouLiveAndYouLearn." His post came the same day Harbaugh was hospitalized for a minor procedure for an irregular heartbeat. Jacobs then said people shouldn't "assume" his remarks were football-related, then followed up with more tweets  including one reading "football is not my life, people" and another saying, "Have you ever been in a spot and you wonder why are you there." Later, he posted that his tweets referred to his brother's boss, who makes "him feel like he is the best thing since slice bread but when the budget is shot he is the first one get laid off, same with two other people I know." Jacobs ran for 571 yards and seven touchdowns last season with New York as a backup to Ahmad Bradshaw. He is the fourth-leading rusher in franchise history with 4,849 yards, but saw his role diminish with the emergence of Bradshaw and became increasingly disgruntled.